Bright Summer Nail Art + Meet Me in Orange County July 9th! Hi guys. Once again...it's been awhile. It's hard to believe over eight months has passed since my last post. There is so much that I miss about blogging, yet I'm really enjoying my time without the daily grind. I was never a prolific poster, but when I did...I spent an obscene number of hours on a single post. It was a lot of time away from the family and I'm loving having a clean house again! Anyway, I thought I'd pop in with an update...which (shocker) also includes some nail art! You can't go wrong with leopard print! This design was done entirely with JulieG polishes: Black Sheep, White Orchid, Oh Em Gee (my all time fave neon pink), Lemon Drop (from the Candy Shoppe Colors Collection) and the brand new Tropical. This teal is part of five new shades just added to the JulieG core collection. I actually took these pics as part of a tutorial for Rite Aid. It needed to be something very easy and summery. I think the step-by-step and photos will be printed on cards and passed out at our next Meet N' Greet (more on that below) or will be included in a mailer - I'm not quite sure. If you follow me on Instagram or Facebook, you may know that I'm headed to Orange County next month for a Meet N' Greet at Rite Aid on Irvine Center Drive. 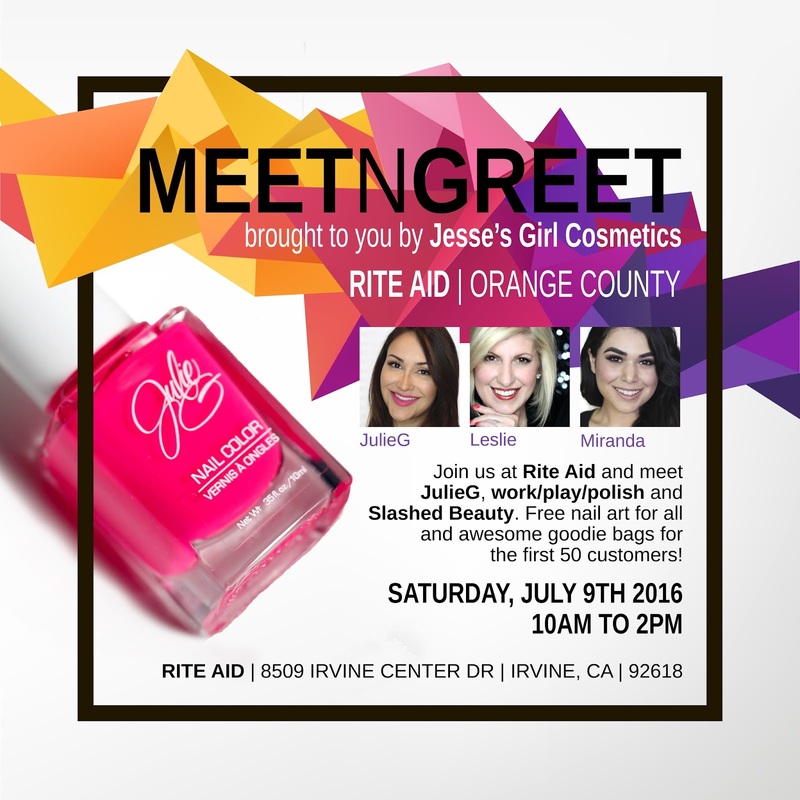 Join JulieG, me, and Miranda from Slashed Beauty from 10am to 2pm on Saturday, July 9th. I'll be doing free nail art all day, so if you have something special going on Saturday night...stop by and get your nails did!